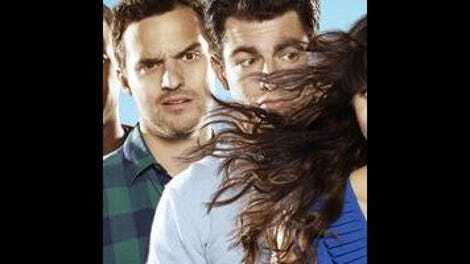 Here’s the thing that I really respect about New Girl’s decision to smash Nick and Jess’ faces together: For all the hesitation in “Cooler,” for all the ways this type of physical connection was put off or denied, for the fact that The Kiss put a potentially lethal clot in one of TV’s best male-female friendships, when it came time for these characters to lock lips, there was no hemming or hawing. It was a move that likely resulted from and caused some spirited debate among the show’s writers and producers, and yet it came across as entirely spontaneous and impulsive. The show reached an intersection in its Nick-and-Jess arc and then immediately crossed it with the utmost confidence. That boldness continues in “Table 34,” an episode that refuses to, in the parlance of its script, “panic moonwalk” away from a sticky situation. Nick and Jess shared a passionate, intimate moment, and even if they reason their way through it, it will always have an impact on their relationship. I love that this week’s episode makes no attempt to ignore the wrench “Cooler” threw into the show’s works. As much as that episode was a narrative milestone for the show, I think “Table 34” is the half hour that demonstrates how far the show has come in 40 episodes. This isn’t an episode that bows to television conventions; it sees the potential roadblock of “Nick and Jess kissed—now what?” and plows right on through. Tonight’s episode feels all the bolder for the way it recognizes the gravity of its situation: As Winston says, if things go sour between Nick and Jess, it will have a permanent effect on the ecosystem of the loft. Someone will have to move out, and it will be Nick. It’s somewhat dispiriting to watch the show reach for the same self-destruct protocol that was initiated and defused at the end of the first season, but it’s in line with the rest of “Table 34” to illustrate that there are consequences for such rash decisions. An impulsive life was once a happy life for Nick and Cece, but the events of the Indian marriage convention—which cursory Googling indicates is a real thing—show that a little foresight now and then couldn’t hurt. In Nick’s case, thinking through his actions would hurt much less, because his most recent bout of recklessness ends with a punch to the throat from Sam. The marriage convention is a curious setting: It feels a bit contrived at first, and the way Cece brings it up in the first act falls short of “organic.” However, the ice-breaking-and-networking nature of the event provides a lot of wiggle room for an extra chatty script—because what else would the characters do during these “getting to know you” activities other than talk about their delicate situation? Anywhere else, the truly tender “Do you know why we’re at Table 34” conversation between Nick and Cece would be too much show, not enough tell. Here, it’s a natural function of the episode and an unexpected display of the similarities between the characters. Of course, if it was Cece and Schmidt yelling that line in unison, it’d be more difficult to buy. The greatest trick “Cooler” pulled was convincing the world only Nick and Jess existed; bubbling under all that True American action was the tension between Cece and Schmidt, a tension that breaks this week and leads to another tag with a stunning love connection. All the longing glances and false admissions of being over one another have led to “Table 34.” Schmidt’s at his worst (and by worst, I mean best—no one can make cultural insensitivity and bad puns charming the way Max Greenfield can), but he gets his weekly redemption in a speech delivered to the entire convention, an authentically heartfelt moment that removes the final obstacles to the couple’s reunion. Schmidt is just as status-obsessed as all the guys who treat Cece like garbage at the convention—the difference between the two parties is that big squishy Schmidt heart Liz Meriwether and the writing staff can never ignore for too long. For Cece’s part, her actions might seem impulsive, but reuniting with Schmidt is a prospect she must’ve been considering for weeks and weeks. It seems impulsive, but preparing yourself to take home the guy who’s dressed as “a character from The Love Guru” (and takes that as a compliment) requires a lot of mental preparation. The illusion of impulsiveness pays off for “Table 34.” The episode might look like all followthrough, but there’s a lot of backswing here, too—it’s just covered up by bold plotting and storylines that have been waiting for months to break. The writers put in the work to show that part of Jess didn’t want to kiss Nick—but they also took the time to illustrate the broken aspects of her relationship with Sam. It takes a whole episode for her to accept Nick’s apology (almost as long as it takes him to apologize), but even in that moment, the episode plows ahead into uncharted territory. The Kiss will color their interactions for weeks to come, but they don’t have to spend all that time coming to terms with what they’ve done. With “Cooler,” New Girl set a challenge for itself, one with potentially disastrous consequences. In “Table 34,” the show moves forward fearlessly, all the while proving that it can handle this type of development. There will be some weird hugs, but the show isn’t afraid of that, either. Sam Malone has to be the namesake for David Walton’s character, right? Tall, handsome, good head of hair (as far as we know)—there’s no way all these Cheers parallels are flying around without that show’s male lead lending his first name to Jess’ now-ex-boyfriend. New Girl continues to be the champion of the well-timed cut-to-credits, with Cece’s stupefied reaction to The Kiss last just long enough to maintain its funniness without overstaying its welcome.